The Leopard 2 is a further development of the highly successful Leopard 1 tank of which 6,000 were produced. Developed in the early 1970’s, the Leopard 2 entered service in 1979 with the Bundeswehr, the German Army. Today the Leopard 2 has become successful enough in Europe that the manufacturer has started calling it the Euro Leopard. However, France, Britain, and Italy all have their own MBTs currently (Leclerc, Challenger 2 and Ariete respectively). The Leopard 2 project was initiated by Krauss-Maffei after Germany withdrew from the joint MBT-70 “super-tank” project with the United States. In 1970 work began on a new main battle tank. The name of the design was determined in 1971 as “Leopard 2” with the original Leopard retroactively becoming the Leopard 1. Seventeen prototypes were ordered that year (only sixteen hulls were built). They had to have a maximum weight of fifty metric tons. On 11 December 1974 a Memorandum of Understanding was signed with the USA for the possible joint production of a new MBT, after the Americans had bought and investigated prototype hull number seven in 1973. In the summer of 1976 prototype 19 was assembled and shipped to the USA, together with hull number 20 and a special target vehicle to test the armor. 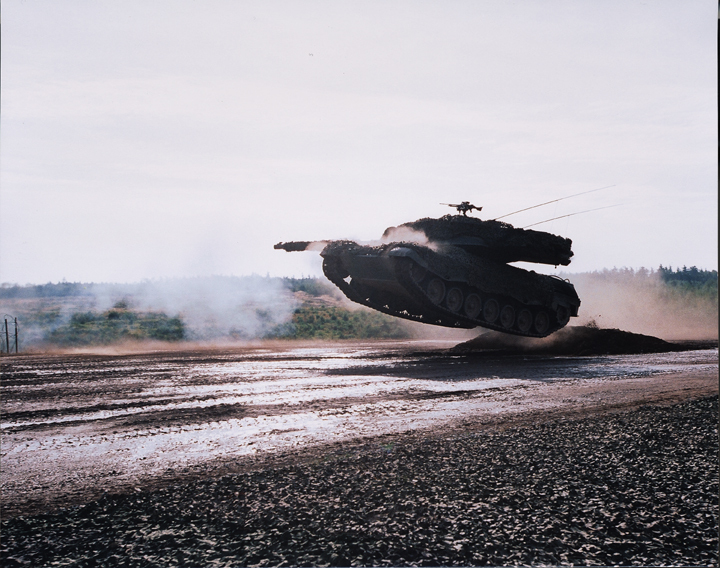 The prototype was called Leopard 2AV (Austere Version) because it had a simplified fire control system. It arrived in the US by the end of August 1976, and comparative tests between the Leopard 2 and the XM1 (the prototype name for the M1 Abrams) prototypes were held from 1 September at Aberdeen Proving Ground, lasting until December 1976. The US Army reported that the Leopard 2 and the XM1 were comparable in firepower and mobility, but the XM1 was superior in armor protection. Today we know this was true as regards a hit by a hollow charge; but against kinetic energy attack the Leopard 2 was almost twice as well protected as the original M1 (650 mm to 350 mm). Its more traditional multi-fuel diesel engine was also more reliable, and provided similar performance with less fuel consumption, although it did produce more noise but less heat.In tests until March 1977 it was found that the Rheinmetall 120 mm smooth bore gun was far superior to the 105 mm M7 mounted on the Abrams, which was confirmed by subsequent NATO tank gunnery contests. In fact the later versions of the Abrams, the M1 and M2 use the Rheinmetall 120 mm gun. The hull is in three sections: the driving compartment at the front, the fighting section in the center, and the engine at the rear of the vehicle.The driver’s compartment is equipped with three observation periscopes. Space to the left of the driver is provided for ammunition stowage. A camera with a 65° horizontal and vertical field of view positioned at the rear of the vehicle and a television monitor provide a reversing aid for the driver.The turret is located in the centre of the vehicle. There is an improvement program which provides third-generation composite armor including high-hardness steel, tungsten and plastic filler with ceramic component, and the additional reinforcement to the turret frontal and lateral armor with externally mounted add-on armor modules. In the event of weapon penetration through the armor, the spall liner reduces the number of fragments and narrows the fragment cone. The spall liner also provides noise and thermal insulation. The reinforcement provides protection against multiple strike, kinetic energy rounds and shaped charges. A new smoothbore gun, the 120mm L55 Gun, has been developed by Rheinmetall Waffe Munition GmbH of Ratingen, Germany to replace the shorter 120mm L44 smoothbore tankgun on the Leopard 2. The extension of the barrel length from calibre length 44 to calibre length 55 results in a greater portion of the available energy in the barrel being converted into projectile velocity increasing the range and armor penetration. KMW has developed a mine protection system for the Leopard 2, following a concept definition by an international working group from Germany, Switzerland, Netherlands, Sweden and Norway, under the lead of the German procurement agency BWB. An order placed in September 2003 involves the modification of 15 Leopard 2A6 tanks for the German Army and ten Leopard 2A5 (Strv 122) for Sweden. The first mine-protected tank was delivered in July 2004. In the summer of 2007 Canada borrowed 20 Leopard 2 tanks to to support the Canadian deployment in Afghanistan with the first tank handed over after upgrading by KMW on August 2, 2007 and arrived in Afghanistan on August 16, being delivered by a NATO AN-124 based in Germany. This is a leopard 1 C 2 with the 105 mm Gun. The video is from CFB Gagetown in New Brunswick Canada. Good vid, real cool, but wrongly represented. A fine battle tank, should do well against the russian/chinese defending eastern Europe’s flank. Completely wrong. This is a Leopard 1,the crew is 4, the gun is 105 mm. Check your facts before posting such nonsense.